When I woke up this morning, there was a howling arctic wind making the house rattle. The temperature, already bitterly cold, was forecast to drop all through the day. Every now and again there was a sudden CRASH! out on the deck as the wind shook some icicles loose. I opened the shades to let in the morning light as I usually do, but there wasn’t much of it to be seen. In fact, it was so dark that it didn’t even look like morning. If there hadn’t been multiple clocks in the house to confirm the time, I might easily have thought that I got up a few hours before dawn by mistake. But nope, it really was morning, and time to get about my workday. My husband, on his way to the office after a two-week vacation, told me he couldn’t believe I had opened the shades on a morning like this. Trying to sound cheerful, I said it looked like the sun might be coming out a little, and I pointed to a feeble little ray that had almost made its way through the thick clouds. He just shook his head, got his coffee, and headed out to work. 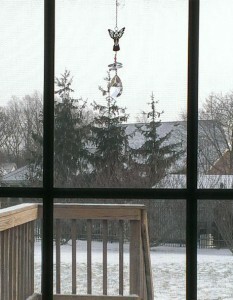 I have a suncatcher in the window of my study—an angel with a crystal teardrop hanging beneath it. On sunny days it fills the room with tiny rainbows. On a day like this, however, the poor little angel couldn’t do much but sit there reflecting the gray sky. I took a picture with my phone and attached it to a text message to a friend on the West Coast, telling her that the angel looked like it needed some sunlight as much as I did. She sent me a cheerful reply with a smiley at the end, telling me how much she loved the photo and that she’s always happy to see snow because there is so little of it where her family lives. “You can have as much of mine as you want,” I told her; but by then, I wasn’t really complaining. Her message brought back pleasant memories of visiting my grandparents in Connecticut as a child, and how exciting it was to see snowflakes falling. On this gray day, it was a welcome reminder that how much we enjoy our lives has a lot to do with perspective.